Featured Mural - The Revolution Marion began a new chapter following The Great Recession, with a huge initiative to "Shop Local" as one strategy to rebuild the town's economy and restore community pride. Aaron Barr, a Marion native living in NYC, offered his services and one Thanksgiving weekend, came home to kick start "The Marion Revolution". The popular image has been used on posters, stickers and more, featuring iconic images of this SWVA town. Mural Mention#1 The "Mayan Mural", on the rear wall of the Lincoln Theatre, represents a series of Mayan themed glyphs from the unique interior design of this restored 1929 treasure. 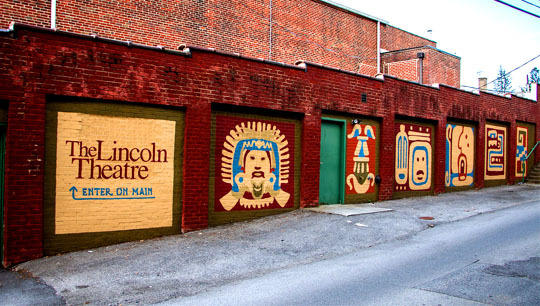 Artist and design was Kristin Untiedt-Barnett, following the theatre design of the original Mayan Revival scenery from Novelty Studios of New York. Aaron Lloyd Barr is an artist, musician, and agent at Bernstein & Andriulli, a premier creative management agency based in New York City. At his day job, Aaron�s primary focus is managing and building the careers of artists which includes creating meaningful and impactful collaborations with his artists and select clients. Artists on his roster include Tristan Eaton, Josh Cochran, Stanley Chow, Shotopop, and Brendan Monroe to name a few. He�s worked on collaborations and projects with clients such as Converse, Apple, Deloitte, and Hublot. As an artist, he continues to experiment with mediums of the visual nature as well as in the music space where he writes and performs under the moniker Del Caesar. Before pursuing life in the arts, Aaron proudly grew up in the beautiful mountains of southwest Virginia where his family still reside. There, he developed a love for the outdoors and continues to sneak away on weekends for trips outside the city to fly fish. He currently lives in Brooklyn with his lovely wife and beautiful baby daughter.